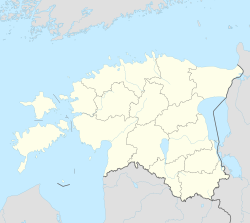 Aruküla is a village in Lääneranna Parish, Pärnu County, in southwestern Estonia. It has a population of 76 (as of 1 January 2011). Uue-Varbla Manor (Neu-Werpel) is located in Aruküla. It was established in 1799 by detaching it from the nearby Vana-Varbla Manor (Alt-Werpel). The Early-Classical wooden main building was constructed around the year 1800. Nowadays it houses the Varbla Museum. ^ a b "Rahvastik ja külad" (in Estonian). Varbla vald. Archived from the original on 16 March 2012. Retrieved 24 May 2011. ^ "Uue-Varbla Manor". Estonian Manors Portal. Retrieved 25 May 2011. This page was last edited on 4 January 2018, at 15:47 (UTC).